This is Chapter 31 from the revised online version of The Republic of Rumi: a Novel of Reality. With reference to the German “Thinker of Life” Goethe, the reader is informed here about the impending rise of the “New Adam” which is the reader themselves. The second enclave is A Message from the East. It appeared in 1923 and much was added to it a year later. The atmosphere changes as soon as you enter this part. In the previous part, you have seen that the Garden has been woven with the meanings of the Quran and it represents the secret life of the Muslim nation. Despite this, in the very introduction of A Message from the East, the Poet introduces you to a Western poet and thinker – Johanne Wolfgang von Goethe (1749-1832). It is Europe at the beginning of the nineteenth century. The French conqueror Napoleon is ravaging Europe, Africa and India but living in the duchy of Weimer in his native Germany, Goethe is remained remarkably untouched despite his admiration for the genius of Napoleon. Goethe’s many influences have included Persian literature – an elder poet has advised him to pay attention to Saadi of Shiraz who said, “Children of Adam are limbs to each other, since they are of the same pure essence” while a contemporary has dramatized the fourth story from the Seven Beauties of Nezami Ganjavi. Ferdowsi and Attar have also influenced Goethe but his love of Iran reaches a new height when he gets to read the Divan of Hafiz in German in 1812. Germany is in bad shape, Goethe is sixty-five but the music of Hafiz arouses in his imagination a mighty storm. In the songs of the nightingale of Shiraz, he perceives his own image and begins to hallucinate that he was Hafiz in an earlier existence, and that the knowledge of mysteries has somehow survived in him. Still, he is not an imitator of any Persian poet and his glance rests only on those Oriental truths which his Western temperament can assimilate. He calls a book of his poems the West-Eastern Divan, and at the beginning of the next century, the book falls in to the hand of an Indian who has felt similar associations with Hafiz and knows the German language. He is Iqbal, the Poet, who is a knower of secrets like Hafiz and Goethe. He writes back to Goethe after one hundred years and calls his book A Message from the East. That is where you are now. “The internal unrest of the world’s nations, which we cannot assess properly because of being ourselves affected by it, is the fore-runner of a great spiritual and cultural revolution,” the Poet tells you. This observation is also true about the present stage in your journey through the Garden: just like “the internal unrest of the world’s nations” in the Poet’s times, there now seems to be an internal unrest in the Garden since chapters on the Muslim nation and Quran have been followed immediately by the glorification of a Western thinker, Goethe. You cannot assess this internal unrest properly since you are yourself being “affected by it” just as the Poet’s generation was being affected by the internal unrest of nations. If that unrest was “the fore-runner of a great spiritual and cultural revolution” then the unrest of the Garden could be “the fore-runner of a great spiritual and cultural revolution” in your “self.” You may remember that such a revolution was the promise held out in ‘A Parable Never Told’ that started you in search of Joseph in the first place. “Europe’s Great War was a catastrophe which destroyed the old world order in almost every respect, and now out of the ashes of civilization and culture Nature is building up in the depths of life a new Adam and a new world for him to live in, of which we get a faint sketch in the writings of Einstein and Bergson. Europe has seen with its own eyes the horrible consequences of its intellectual, moral and economic objectives and has also heard from Signor Nitti (a former prime minister of Italy) the heart-rending story of the West’s decline. It is, however, a pity that Europe’s perspicacious, but conservative, statesmen have failed to make a proper assessment of that wonderful revolution which is now taking place in the human mind. “Regarded from a purely literary standpoint, the debilitation of the forces of life in Europe after the ordeal of the war is unfavorable to the development of a correct and mature literary ideal. Indeed, the fear is that the minds of the nations may be gripped by that slow-pulsed ‘Ajamiyat which runs away from life’s difficulties, and which fails to distinguish between the emotions of the heart and the thoughts of the brain. However, America seems to be a healthy element in Western civilization, the reason for which perhaps is that it is free from the trammels of old traditions and that its collective intuition is receptive to new ideas and influences. “The East, and especially the Muslim East, has opened its eyes after a centuries-long slumber. But the nations of the East should realize that life can bring about no revolution in its surroundings until a revolution takes place in its inner depths and that no new world can take shape externally until it is formed in the minds of men. This ineluctable law, which has been stated by the Quran in the simple but eloquent words, ‘Verily, God does not change a nation until it changes itself’ governs both the individual and the collective spheres of life; and it is the truth of this law that I have tried to keep in view in my Persian works. 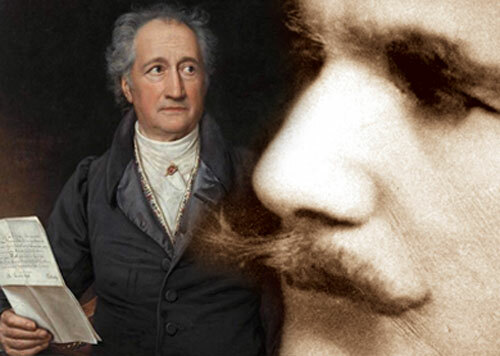 (a) Rumi and Iqbal: This first clue pointed to both great poets being followers of Prophet Muhammad but now surprisingly a non-Muslim poet Goethe has joined the club – Rumi, Goethe and Iqbal is the new order of things but can a non-Muslim join the club? Perhaps the “great cultural and spiritual revolution” that is coming up ahead will provide the answer. (b) Kings: They had been identified to stand for state, laws and government but the Great European War (World War I) has uprooted the states, laws and governments of the old world. Will the “great cultural and spiritual revolution” help construct a new model of state, laws and government? (c) Joseph: Although still unknown, Joseph had become connected with overcoming the physical dimensions of one’s existence (as reflected in the secrets of the title of Ali, “the master of clay”). If the “great cultural and spiritual revolution” of the near future requires such unification of matter and spirit then Joseph is the key to such a revolution. (d) Sufism: You understood it as the opening of the door of the world with the key of religion and the “great cultural and spiritual revolution” seems to be just that – an age is coming when state, laws and governments shall be founded on the principles of Sufism if only Joseph could be found, since he is the key. (e) Time: You understood that eternity was less than a moment of Prophet Muhammad’s time, who also said, “Do not vilify Time, for God says: I am Time.” Blaming the modern times as evil can easily turn you blind to the “great cultural and spiritual revolution” and Joseph will tell you how to deal with the seemingly undesirable trends of modern times. The Poet has said, “Europe’s Great War was a catastrophe which destroyed the old world order in almost every respect, and now out of the ashes of civilization and culture Nature is building up in the depths of life a new Adam and a new world for him to live in…” The selfhood that you acquired through interacting with that old world through the Garden has also been lost and now out of the ashes of civilization Nature is building you up in the depths of life. The meaning of the five clues has changed because now you know who you are. You are the New Adam. I've been reading some quotes/works and bios on Goethe...the bios really don't corroborate. Would you plz recommend the histories of him you most trust...or maybe this is not important to your points? I will return for a more thorough look and read of these postings and your works which bring together so much history, philosophy, religion, etc. in a rather seamless way. Sometime, I'd also like to see what you are hoping for your readers in terms of inter-activity? Connie, thanks for your comment. Kindly let me know a little more about what you mean by the biographies of Goethe not corroborating. They don't corroborate what? One reference indicates that he embraced a small rare sect of Judaism which spoke of the "perfect man"-- just before he died. Other items speak of Goethe having a more bisexual or heterosexual inclination which may be irrelevant or again a guess or bias on the writer's part? As I mentioned, there is a wonderful item in the Harvard Classics on select PREFACES including his very engaging one...a delight as was his venture into a literary magazine with a friend. None of this confusion or biography really troubles me as far as the truth which stands except that now in really studying him for the first time I want some comparative solid information to use along with your own work. A few years ago even and at least as a youth I would have been perhaps worried due to my own religious teaching perhaps and not read him after discovering some confusion as to his background...Yet now, I am just interested in knowing what material to rely upon. Like me, others younger and also new at much of this study may now look up to Goethe as representative of our Western best in literature and life...because of your's and Allama Iqbal's references, look him up and need direction, like I do. I was also quite in wonder and happy at the thought he may have fully embraced Islam all his life. And I must say, although I respect many Jewish writers and human rights folk and have a few such as friends, respected acquaintances...I was thrilled to think that this genius from the west may have been one of the few who embraced Islam...I would like to imagine he held to that belief all his life. Even if he may be a bit disappointing or changed his thinking a lot during his life, so do we all disappoint and change.. So my question is just where I might go for items on Goethe which are difficult to find or may be unavailable to us in the US and which enhance your own awareness? Perhaps, where on the internet, for example? I am wanting to read others on people mentioned in your work...and whatever is found will not take away the trust and value I see in everything you do nor in the beauty of Goethe. Hafiz, also holds a special fascination of beauty, truth and sublime understanding for me as well. This is extremely interesting journey and Garden is speaking to us and we are interacting with garden. New Adam is what really emerges from ashes and rises and stands tall. Faust is the book that is masterpiece of Goethe, and the poet, the writer should be reached through his works and not through his biographies and critical analysis written by others, this is what I feel.